The Island Way Grill is a concealed, but elegant waterfront restaurant with very reasonable prices. Located off the Clearwater Beach Causeway between downtown Clearwater and Clearwater Beach, the official address is 20 Island Way. It is right off FL 60 (Gulf-to-Bay Blvd) which runs over the Clearwater Beach Causeway. 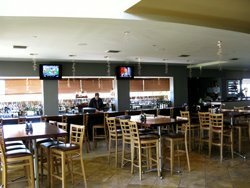 This elegant waterfront restaurant is just east of the Clearwater Aquarium . The main dishes are centered on fresh seafood caught daily from the Island Way Grill's own boats. Their motto is, "If the fish is any fresher...it is still in the Gulf." Mahi, tuna and snapper are the staples, with other local fish mixed in. If you do not like fish, don't worry. The menu has an assortment of stakes, grilled chicken and some outstanding meat loaf. You read that correctly...the meat loaf is exceptional and can easily be split between you and a date. It is a huge serving. All of the soups and sauces are prepared by hand. Plus, there is liberal use of fresh vegetables. This place is first-class all the way. The inside dining area is upscale. It is a beautiful and romantic setting. The wood bar is glossed to a high sheen and the large floor tiles give the area an understated, but elegant atmosphere. Across from the bar is an open fire pit where the majority of food is cooked. It is fired with oak and citrus to give it a rich, smokey taste...and the assortment of herbs and seasonings are pleasant, not spicy. 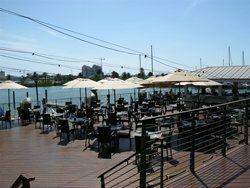 To me, if you are in Florida, you want to eat outside on some kind of waterfront. The Island Way Grill does not disappoint. It is waterfront dining at its best. The outside deck has comfortable chairs, umbrellas for shade, and a quiet view of the lagoon. There is always a soft breeze coming off the water. Don't be surprised to see locals, or boaters from down in St. Petersburg , pulling up to the connected dock. A classy place like this may be hidden, but it is not unknown. 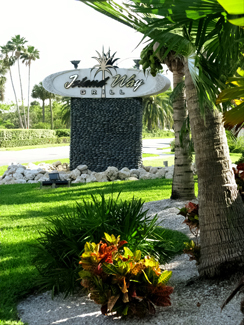 The Island Way Grill opens for lunch at 4:00pm each day (although there is a tremendous Sunday Brunch starting at 11:00am). The Early Island Menu is in place between 4:00pm and 5:00pm. This was the best time for us. It was completely uncrowded on the spacious deck and we enjoyed a leisurely and quiet meal. We chose the Volcanic Island Meatloaf with the Wasabi mashed potatoes and the Tumbleweed onions. Our waiter was gracious enough to suggest we split it and he was right. With the soft, hot fresh bread and a small side of Asian vegetables, we were filled and satisfied. The setting was relaxing, the food was delicious, the service was top-drawer. The biggest surprise...? The bill was UNDER $15. You can describe the Island Way Grill in two words...total class. From the seashell stucco/red brick architecture...to the ultra-clean restrooms...to the stacks of fresh oysters, clams, and pink shrimp by the open fire pit...everyone involved has done their very best to make dining here a memorable experience. If you have to pick only one place to eat, make this hidden treasure your first choice.